Jewish communities have existed in the territory of Ukraine from the time of Kievan Rus' (late 9th to mid-13th century) and developed many of the most distinctive modern Jewish theological and cultural traditions such as Hasidism. According to the World Jewish Congress, the Jewish community in Ukraine constitute the third biggest Jewish community in Europe and the fifth biggest in the world. While at times it flourished, at other times the Jewish community faced periods of persecution and antisemitic discriminatory policies. In the Ukrainian People's Republic, Yiddish was a state language along with Ukrainian and Russian. At that time there was created the Jewish National Union and the community was granted an autonomous status. Yiddish was used on Ukrainian currency in 1917–1920. Before World War II, a little under one-third of Ukraine's urban population consisted of Jews who were the largest national minority in Ukraine. 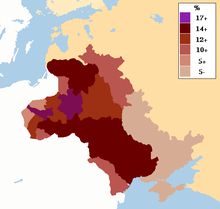 Ukrainian Jews are comprised by a number of sub-groups, including Ashkenazi Jews, Mountain Jews, Bukharan Jews, Crimean Karaites, Krymchak Jews and Georgian Jews. In the westernmost area of Ukraine, Jews were mentioned for the first time in 1030. An army of Cossacks and Crimean Tatars massacred and took into captivity a large number of Jews, Roman Catholic Christians and Uniate Christians in 1648–49. Recent estimates range from fifteen thousand to thirty thousand Jews killed or taken captive, and 300 Jewish communities totally destroyed. During the 1821 anti-Jewish riots in Odessa after the death of the Greek Orthodox patriarch in Constantinople, 14 Jews were killed. Some sources claim this episode as the first pogrom. At the start of 20th century, anti-Jewish pogroms continued to occur. When part of the Russian Empire in 1911 to 1913, the antisemitic attitudes can be seen in the number of blood libel cases. In 1915, the government expelled thousands of Jews from the Empire's border areas. During the 1917 Russian Revolution and the ensuing Russian Civil War, an estimated 31,071 Jews were killed during 1918–1920. During the establishment of the Ukrainian People's Republic (1917–21), pogroms continued to be perpetrated on Ukrainian territory. In Ukraine, the number of civilian Jews killed during the period was between 35 and 50 thousand. Pogroms erupted in January 1919 in the northwest province of Volhynia and spread to many other regions of Ukraine. Massive pogroms continued until 1921. The actions of the Soviet government by 1927 led to a growing antisemitism in the area. Total civilian losses during World War II and German occupation in Ukraine are estimated at seven million, including over a million Jews shot and killed by the Einsatzgruppen and by their many local Ukrainian supporters in the western part of Ukraine. 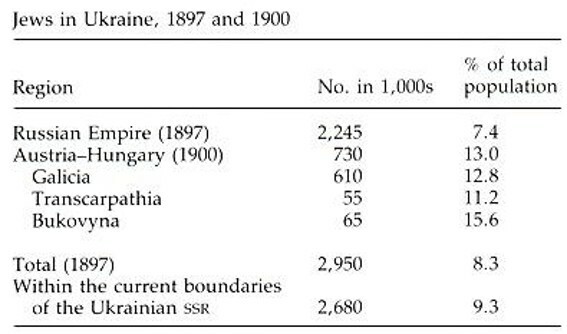 Ukraine had 840,000 Jews in 1959, a decrease of almost 70% from 1941 (within Ukraine's current borders). Ukraine's Jewish population declined significantly during the Cold War. In 1989, Ukraine's Jewish population was only slightly more than half of what it was thirty years earlier (in 1959). The majority of the Jews who remained in Ukraine in 1989 left Ukraine and moved to other countries (mostly to Israel) in the 1990s during and after the collapse of Communism. Antisemitic graffiti and violence against Jews are still a problem in Ukraine. By the 11th century, Byzantine Jews of Constantinople had familial, cultural, and theological ties with the Jews of Kiev. For instance, some 11th-century Jews from Kievan Rus participated in an anti-Karaite assembly held in either Thessaloniki or Constantinople. One of the three Kievan city gates in the times of Yaroslav the Wise was called Zhydovski (Judaic). In Halychyna (Galicia), the westernmost area of Ukraine, Jews were mentioned for the first time in 1030. From the second part of the 14th century, they were subjects of the Polish kings, and magnates. The Jewish population of Halychyna and Bukovyna, part of Austria-Hungary, was extremely large; it made up 5% of the global Jewish population. From the founding of the Kingdom of Poland in the 10th century through the creation of the Polish–Lithuanian Commonwealth in 1569, Poland was considered one of the most diverse countries in Europe. It became home to one of the world's largest and most vibrant Jewish communities. The Jewish community in the territory of Ukraine-proper during the Polish–Lithuanian Commonwealth became one of the largest and most important ethnic minority groups in Ukraine. The Ukrainian Cossack Hetman Bohdan Khmelnytsky led a Cossack uprising, known as Khmelnytsky Uprising (1648–1657), under the premise that the Poles had sold them as slaves "into the hands of the accursed Jews." At that time it is estimated that the Jewish population in Ukraine numbered 51,325. An army of Cossacks and Crimean Tatars massacred and took into captivity a large number of Jews, Roman Catholics and Uniates in 1648–49. Recent estimates range from fifteen thousand to thirty thousand Jews killed or taken captive, and 300 Jewish communities totally destroyed. The Cossack Uprising and the Deluge left a deep and lasting impression on the Jewish social and spiritual life. In this time of mysticism and overly formal rabbinism came the teachings of Israel ben Eliezer, known as the Baal Shem Tov, or BeShT, (1698–1760), which had a profound effect on the Jews of Eastern Europe. His disciples taught and encouraged a new fervent brand of Judaism, related to Kabbalah, known as Hasidism. The rise of Hasidism had a great influence on the rise of Haredi Judaism, with a continuous influence through its many Hasidic dynasties. A radically different movement was started by Jacob Frank in the middle of the 18th century. Frank's teachings were extremely unorthodox (such as purification through transgression, as well as adoption of elements of Christianity), and he was excommunicated along with his numerous followers. They eventually converted to Catholicism. Map of the Pale of Settlement. The traditional measures of keeping the Russian Empire free of Jews were hindered when the main territory of Polish-Lithuanian Commonwealth was annexed during the partitions of Poland. During the second (1793) and the third (1795) partitions, large populations of Jews were taken over by the Russian Empire, and Catherine the Great established the Pale of Settlement that included Congress Poland and Crimea. During the 1821 anti-Jewish riots in Odessa after the death of the Greek Orthodox patriarch in Constantinople, 14 Jews were killed. Some sources claim this episode as the first pogrom, while according to others (such as the Jewish Encyclopedia, 1911 ed.) say the first pogrom was the 1859 riot in Odessa. The term became common after a wave of large-scale anti-Jewish violence swept southern Russian Empire, including Ukraine, between 1881 and 1884, after Jews were blamed for the assassination of Alexander II. In May 1882, Alexander III of Russia introduced temporary regulations called May Laws that stayed in effect for more than thirty years, until 1917. Systematic policies of discrimination, strict quotas on the number of Jews allowed to obtain education and professions caused widespread poverty and mass emigration. In 1886, an edict of Expulsion was applied to the Jews of Kiev. In 1893–1894, some areas of Crimea were cut out of the Pale. When Alexander III died in Crimea on 20 October 1894, according to Simon Dubnow: "as the body of the deceased was carried by railway to St. Petersburg, the same rails were carrying the Jewish exiles from Yalta to the Pale. The reign of Alexander III ended symbolically. It began with pogroms and concluded with expulsions." Odessa became the home of a large Jewish community during the 19th century, and by 1897 Jews were estimated to comprise some 37% of the population. Persons of Jewish origin were over-represented in the Russian revolutionaries leadership. However, most of them were hostile to traditional Jewish culture and Jewish political parties, and were loyal to the Communist Party's atheism and proletarian internationalism, and committed to stamp out any sign of "Jewish cultural particularism". Counter-revolutionary groups, including the Black Hundreds, opposed the Revolution with violent attacks on socialists and pogroms against Jews. There was also a backlash from the conservative elements of society, notably in spasmodic anti-Jewish attacks – around five hundred were killed in a single day in Odessa. Nicholas II of Russia himself claimed that 90% of revolutionaries were Jews. At the start of 20th century, anti-Jewish pogroms continued to occur in cities and towns across the Russian Empire such as Kishinev, Kiev, Odessa, and many others. Numerous Jewish self-defense groups were organized to prevent the outbreak of pogroms among which the most notorious one was under the leadership of Mishka Yaponchik in Odessa. In 1905, a series of pogroms erupted at the same time as the Revolution against the government of Nicholas II. The chief organizers of the pogroms were the members of the Union of the Russian People (commonly known as the "Black Hundreds"). From 1911 to 1913, the antisemitic tenor of the period was characterized by a number of blood libel cases (accusations of Jews murdering Christians for ritual purposes). One of the most famous was the two-year trial of Menahem Mendel Beilis, who was charged with the murder of a Christian boy (Lowe 1993, 284–90). The trial was showcased by the authorities to illustrate the perfidy of the Jewish population. From March to May 1915, in the face of the German army, the government expelled thousands of Jews from the Empire's border areas, which coincide with the Pale of Settlement. During the 1917 Russian Revolution and the ensuing Russian Civil War, an estimated 70,000 to 250,000 Jewish civilians were killed in the atrocities throughout the former Russian Empire in this period. In the territories of modern Ukraine an estimated 31,071 during 1918–1920. During the establishment of the Ukrainian People's Republic (1917–1921), pogroms continued to be perpetrated on Ukrainian territory. In the Ukrainian People's Republic, Yiddish was an official language. And all Government posts and institutions had Jewish members. A Ministry for Jewish Affairs was established (it was the first modern state to do so). All rights of Jewish culture were guaranteed. All Jewish parties abstained or voted against the Tsentralna Rada's Fourth Universal of 25 January 1918 which was aimed at breaking ties with Bolshevik Russia and proclaiming a sovereign Ukrainian state, since all Jewish parties were strongly against Ukrainian independence. Only in Ukraine, the number of civilian Jews killed during the period was estimated to be between 35 and 50 thousand. Archives declassified after 1991 provide evidence of a higher number; in the period from 1918 to 1921, "according to incomplete data, at least 100,000 Jews were killed in Ukraine in the pogroms." The Ukrainian People's Republic did issue orders condemning pogroms and attempted to investigate them. But it lacked authority to stop violence. In the last months of its existence it lacked any power of creating social stability. Among prominent Ukrainian statesmen of this period were Moisei Rafes, Pinkhas Krasny, Abram Revutsky, Moishe Zilberfarb, and many others. (see General Secretariat of Ukraine) The autonomy of Ukraine was openly greeted by the Ukrainian Jewish Volodymyr Zhabotinsky. Between April and December 1918 the Ukrainian People's Republic was non-existent and overthrown by the Ukrainian State of Pavlo Skoropadsky who ended the experiment in Jewish autonomy. The February 1917 revolution brought a liberal Provisional Government to power in the Russian Empire. On 21 March/3 April, the government removed all "discrimination based upon ethnic religious or social grounds". The Pale was officially abolished. The removal of the restrictions on Jews' geographical mobility and educational opportunities led to a migration to the country's major cities. One week after the 25 October / 7 November 1917 Bolshevik Revolution, the new government proclaimed the "Declaration of the Rights of the Peoples [Nations] of Russia," promising all nationalities the rights of equality, self-determination and secession. Jews were not specifically mentioned in the declaration, reflecting Lenin's view that Jews did not constitute a nation. In 1918, the RSFSR Council of Ministers issued a decree entitled "On the Separation of Church from State and School from Church", depriving religious communities of the status of juridical persons, the right to own property and the right to enter into contracts. The decree nationalized the property of religious communities and banned their assessment of religious tuition. As a result, religion could be taught or studied only in private. On 1 February 1918 the Commissariat for Jewish National Affairs was established as a subsection of the Commissariat for Nationality Affairs. It was mandated to establish the "dictatorship of the proletariat in the Jewish streets" and attract the Jewish masses to the regime while advising local and central institutions on Jewish issues. The Commissariat was also expected to fight the influence of Zionist and Jewish-Socialist Parties. On 27 July 1918 the Council of People's Commissars issued a decree stating that antisemitism is "fatal to the cause of the ... revolution". Pogroms were officially outlawed. On 20 October 1918 the Jewish section of the CPSU (Yevsektsia) was established for the Party's Jewish members; its goals were similar to those of the Jewish Commissariat. The pogroms which erupted in January 1919 in the northwest province of Volhynia spread during February and March to the cities, towns, and villages of many other regions of Ukraine. After Sarny it was the turn of Ovruc, northwest of Kiev. In Tetiev on 25 March, approximately 4,000 Jews were murdered, half in a synagogue set ablaze by Cossack troops under Colonels Kurovsky, Cherkowsy, and Shliatoshenko. Then Vashilkov (6 and 7 April). In Dubovo (17 June) 800 Jews were decapitated in assembly-line fashion. According to David A. Chapin, the town of Proskurov (now Khmelnitsky), near the city of Sudilkov, "was the site of the worst atrocity committed against Jews this century before the Nazis." Massive pogroms continued until 1921. On 15 February 1919, during the Ukrainian-Soviet war, Otaman Semesenko initiated a pogrom Proskurov in which a large number of Jews were massacred on Shabbat (parashah Tesaveh) from three p.m. until next Sunday (?Saturday). Semesenko claimed that the pogrom was in retaliation for a previous Bolshevik Uprising, which he believed was led by Jews. According to the "pinqasim" record books the murdered in the pogrom included 390 men, 309 women and 76 children. The number of wounded exceeded 500. Two weeks later the Order 131 was published in the central newspaper by the head of Directorate of Ukraine. In it Symon Petliura denounced such actions and eventually executed otaman Semesenko by firing-squad in November 1919. The Semesenko's brigade was disarmed and dissolved. This event is especially remarkable for being used to justify Schwartzbard for assassination of the Ukrainian leader in 1926. Although no facts of Petliura's direct involvement was ever proven, Schwartzbard was acquitted in light of revenge. The series of Jewish pogroms in various places around Ukraine culminated in the Kiev pogroms of 1919 between June and October of that year. In July 1919, the Central Jewish Commissariat dissolved the kehillot (Jewish Communal Councils). The kehillot had provided a number of social services to the Jewish community. From 1919–1920, Jewish parties and Zionist organizations were driven underground as the Communist government sought to abolish all potential opposition. The Yevsektsiya Jewish section of the Soviet Communist party was at the forefront of the anti-religious campaigns of the 1920s that led to the closing of religious institutions, the break-up of religious communities and the further restriction of access to religious education. To that end a series of "community trials" against the Jewish religion were held. The last known such trial, on the subject of circumcision, was held in 1928 in Kharkiv. At the same time, the body also worked to establish a secular identity for the Jewish community. In 1921 a large number of Jews in the newly formed USSR emigrated to Poland, as they were entitled by a peace treaty in Riga to choose the country they preferred. Several hundred thousand joined the already numerous Jewish minority of the Polish Second Republic. On 31 January 1924 the Commissariat for Nationalities' Affairs was disbanded. On 29 August 1924 an official agency for Jewish resettlement, the Commission for the Settlement of Jewish Toilers on the Land (KOMZET), was established. KOMZET studied, managed and funded projects for Jewish resettlement in rural areas. A public organization, the Society for the Agricultural Organization of Working Class Jews in the USSR (OZET), was created in January 1925 to help recruit colonists and support the colonization work of KOMZET. For the first few years the government encouraged Jewish settlements, particularly in Ukraine. Support for the project dwindled throughout the next decade. In 1938 OZET was disbanded, following years of declining activity. On 8 April 1929 the new Law on Religious Associations codified all previous religious legislation. All meetings of religious associations were to have their agenda approved in advance; lists of members of religious associations had to be provided to the authorities. In 1930 the Yevsektsia was dissolved, and there was now no central Soviet-Jewish organization. Although the body had served to undermine Jewish religious life, its dissolution led to the disintegration of Jewish secular life as well; Jewish cultural and educational organizations gradually disappeared. When the Soviet government reintroduced the use of internal passports in 1933, "Jewish" was considered an ethnicity for these purposes. The cities with the largest populations of Jews in 1926 were Odessa, 154,000 or 36.5% of the total population; Kiev, 140,500 or 27.3%; Kharkiv, 81,500 or 19.5%; and Dnipropetrovsk, 62,000 or 26.7%. In 1931 Lviv's Jewish population numbered 98,000 or 31.9%, and in Chernivtsi, 42,600 or 37.9%. As the Soviet government annexed territory from Poland, Romania (both would be incorporated into the Ukrainian SSR after World War II) and the Baltic states, roughly two million Jews became Soviet citizens. Restrictions on Jews that had existed in the formerly independent countries were now lifted. At the same time, Jewish organizations in the newly acquired territories were shut down and their leaders were arrested and exiled. Approximately 250,000 Jews escaped or were evacuated from the annexed territories to the Soviet interior prior to the Nazi invasion. In 1921, Crimea became an autonomous republic. In 1923, the All-Union Central Committee passed a motion to resettle a large number of the Jewish population from Ukrainian and Belarusian cities to Crimea. 50400 families were moved. The plan to further resettle Jewish families was again confirmed by the Central Committee of the USSR on 15 July 1926 assigning 124 million roubles to the task and also receiving 67 million from foreign sources. The Soviet initiative of Jewish settlement in Crimea was opposed by Symon Petlura which he regarded as a provocation. This train of thought was supported by Arnold Margolin who stated that it would be dangerous to set up Jewish colonies there. The actions of the Soviet government for the supported settlement in Crimea with Jewish families by 1927 led to a growing antisemitism in the area. In 1944, it was suggested to Stalin to form a Jewish Soviet Socialist Republic in Crimea, however, the idea was not materialised. Total civilian losses during the war and German occupation in Ukraine are estimated at seven million, including over a million Jews shot and killed by the Einsatzgruppen and by local Ukrainian supporters in various regions of Ukraine. 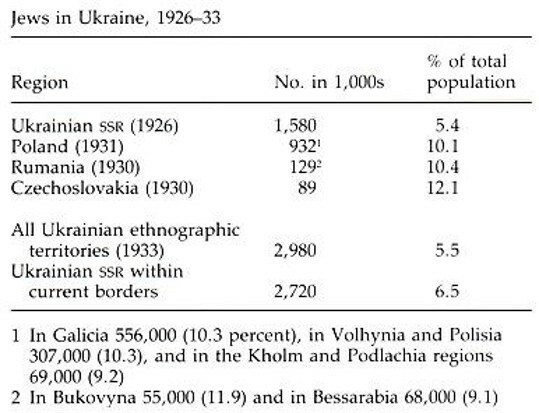 Ukraine had 840,000 Jews in 1959, a decrease of almost 70% from 1941 (within Ukraine's current borders). Ukraine's Jewish population declined significantly during the Cold War. In 1989, Ukraine's Jewish population was only slightly more than half of what it was thirty years earlier (in 1959). The overwhelming majority of the Jews who remained in Ukraine in 1989 left Ukraine and moved to other countries (mostly to Israel) in the 1990s during and after the collapse of Communism. Such new immigrants to Israel included artists, such as Marina Maximilian Blumin and street artist Klone, as well as activists, such as Gennady Riger and Lia Shemtov. In 1989, a Soviet census counted 487,000 Jews living in Ukraine. Although discrimination by the state all but halted very soon after Ukrainian independence in 1991, Jews were still discriminated against in Ukraine during the 1990s. For instance, Jews were not allowed to attend some educational institutions. Antisemitism has since declined. According to the European Jewish Congress, as of 2014, there are 360,000–400,000 Jews in Ukraine. During the 1990s, some 266,300 Ukrainian Jews emigrated to Israel as part of a wave of mass emigration of Jews from the former Soviet Union to Israel in the 1990s. The 2001 Ukrainian Census counted 106,600 Jews living in Ukraine (the number of Jews also dropped due to a negative birthrate). According to the Public Diplomacy and Diaspora Affairs Minister of Israel, early 2012 there were 250,000 Jews in Ukraine, half of them living in Kiev. By 1999 there were various Ukrainian Jewish organizations who disputed each other's legitimacy. In November 2007, an estimated 700 Torah scrolls previously confiscated from Jewish communities during the Soviet Union's Communist rule were returned to Jewish communes in Ukraine by the state authorities. The Ukrainian Jewish Committee was established in 2008 in Kiev with the aim of concentrating the efforts of Jewish leaders in Ukraine on resolving the community's strategic problems and addressing socially significant issues. The Committee declared its intention to become one of the world's most influential organizations protecting the rights of Jews and "the most important and powerful structure protecting human rights in Ukraine". In the 2012 Ukrainian parliamentary elections, All-Ukrainian Union "Svoboda" won its first seats in the Ukrainian Parliament, garnering 10.44% of the popular vote and the fourth most seats among national political parties; This led to concern among Jewish organizations both inside and outside Ukraine who accused "Svoboda" of openly Nazi sympathies and being antisemitic. In May 2013, the World Jewish Congress listed the party as neo-Nazi. "Svoboda" itself has denied being antisemitic. Antisemitic graffiti and violence against Jews are still a problem in Ukraine. Since the February 2014 ending of the Euromaidan protests unrest has gripped southern and eastern Ukraine, and this escalated in April 2014 into the ongoing war in the Donbass region. In April 2014, leaflets were distributed by three masked man as people left a synagogue in Donetsk (the biggest city in Donbass) ordering Jews to register to avoid losing their property and citizenship "given that the leaders of the Jewish community of Ukraine support the Banderite junta in Kiev[nb 1] and are hostile to the Orthodox Donetsk Republic and its citizens". While many speak of a hoax (concerning the authorship of the tracts) which took on international proportions, the fact that these flyers were distributed remains undisputed. Due to the growing 2014 Ukrainian unrest, Ukrainian Jews making aliyah from Ukraine reached 142% higher during the first four months of 2014 compared to the previous year. 800 people arrived in Israel over January–April, and over 200 signed up for May 2014. On the other hand, chief rabbi and Chabad emissary of Dnipropetrovsk Shmuel Kaminezki claimed late April 2014 "Today, you can come to Dnipropetrovsk or Odessa and walk through the streets openly dressed as a Jew, with nothing to be afraid of". In August 2014, the Jewish Telegraphic Agency reported that the International Fellowship of Christians and Jews is organizing chartered flights to allow at least 150 Ukrainian Jews, to immigrate to Israel in September. Jewish organizations within Ukraine, as well as the American Jewish Joint Distribution Committee, the Jewish Agency for Israel and the Jewish community of Dnipropetrovsk, have arranged temporary homes and shelters for hundreds of Jews who fled the War in Donbass in eastern Ukraine. Hundreds of Jews have reportedly fled the cities of Luhansk and Donetsk, and Rabbi Yechiel Eckstein stated (in August 2014) that more Jews may leave for Israel if the situation in eastern Ukraine continues to deteriorate.. In the 2019 election Volodymyr Zelensky was elected President of Ukraine. In 2014 the Jews Ihor Kolomoyskyi and Volodymyr Groysman were appointed Governor of Dnipropetrovsk Oblast and Speaker of the Parliament respectively. Groysman is Prime Minister of Ukraine since April 2016. As of 2012, Ukraine had the fifth-largest Jewish community in Europe and the twelfth-largest Jewish community in the world, behind South Africa and ahead of Mexico. The majority of Ukrainian Jews live in four large cities: Kiev (about half of all Jews living in Ukraine), Dnipro, Kharkiv and Odessa. Rabbis Yaakov Dov Bleich of Kiev and Shmuel Kaminezki of Dnipropetrovsk are considered to be among the most influential foreigners in the country. Opened in October 2012 in Dnipro, the multifunctional Menorah center is probably one of the biggest Jewish community centers in the world. There is a growing trend among some Israelis to visit Ukraine on a "roots trip" to follow the footsteps of Jewish life there. Among the places of interest Kiev is usually mentioned, where it is possible to trace the paths of Sholem Aleichem and Golda Meir; Zhytomyr and Korostyshiv, where one can follow the steps of Haim Nahman Bialik; Berdychiv, where one can trace the life of Mendele Mocher Sforim; Rivne, where one can follow the course of Amos Oz; Buchach – the path of S.Y. Agnon; Drohobych – the place of Maurycy Gottlieb and Bruno Schulz. ^ Apparently referring to the support of the Euromaidan protests (that ousted president Viktor Yanukovich) by prominent Jews in Ukraine. ^ a b DellaPergola, Sergio (2 November 2012). Dashefsky, Arnold; Sheskin, Ira (eds.). "World Jewish Population, 2012" (PDF). Current Jewish Population Reports. Storrs, Connecticut: North American Jewish Data Bank. Retrieved 21 September 2013. ^ a b c d e Ukraine. World Jewish Congress. ^ National policy of the Central Council in conditions of Ukrainian independence (January-April 1918). Electronic library of handbooks. ^ "Jewish Urban Population: 1897". Geschichteinchronologie.ch. 7 May 2007. Archived from the original on 23 June 2013. Retrieved 16 April 2013. ^ a b Paul Magocsi, A History of Ukraine, p. 350. University of Washington Press, 1996. ^ a b Baron 1964, 188–91. ^ a b c d e f g h Yekelchyk, Serhy (2007). Ukraine: Birth of a Modern Nation. Oxford University Press. ISBN 978-0-19-530546-3. ^ a b c d Midlarsky, Manus I. (2005). The Killing Trap: Genocide in the Twentieth Century. Cambridge University Press. pp. 46–47. ISBN 978-0-521-81545-1. Retrieved 17 October 2017. ^ a b "Table 30. Immigrants from the USSR (former) by last republic of residence: 1990-2001" (PDF). Central Bureau of Statistics, State of Israel. Archived from the original (PDF) on 14 July 2014. Retrieved 16 April 2013. ^ a b "Anti-Semitism in Ukraine in 2010" (PDF). Human Rights Watch. 7 October 2010. ^ Kevin A. Brook, The Jews of Khazaria, Second Edition, Published by Rowman and Littlefield, pg. 198. ^ Odessa pogroms Archived 21 January 2007 at the Wayback Machine at the Center of Jewish Self-Education "Moria"
^ The Newest History of the Jewish People, 1789–1914 by Simon Dubnow, vol. 3, Russian ed., p. 153. ^ Kiev District Commission of the Jewish Public Committee for Relief to Victims of Pogroms. State Archive of the Kiev Oblast. Fond FR-3050 by Vladimir Danilenko, Director of the State Archive of the Kiev Oblast. ^ a b Korey 1978, 90. ^ Insight on the News 21 May 1990b, 17. ^ Soviet Jewish Affairs Autumn-Winter 1990, 27. ^ Korey 1978, 79; Pinkus 1988, 58–59. ^ a b Survey January 1968, 77–81. ^ a b Rothenberg 1978, 172–73; Levin 1988, 78–80. ^ a b c Pinkus 1988, 62. ^ Elias Tcherikower, "The Pogroms in Ukraine in 1919" originally in Yiddish, YIVO Institute, 1965; The Berdichev Revival. Retrieved 13 April 2012. ^ "The Pogroms". Grossmanproject.net. 7 November 1905. Retrieved 16 April 2013. ^ Schechtman 1978, 113; Levin 1988, 90–91. ^ Carr 1950, 401, 413. ^ Levin 1988, 131; Schwarz 1951, 162–63. ^ Problems of Communism May–June 1973, 10–11. ^ Rothenberg 1978, 180; Altshuler 1993, 85. ^ Soviet Jewish Affairs Summer 1991, 53–54. ^ Mykola Vladzimirsky. "Віктор Даниленко Проекти Єврейської Автономії В Радянському Криму". Ukrlife.org. Retrieved 16 April 2013. ^ . Yivoencyclopedia.org. Retrieved on 2013-04-14. ^ Greg Dawson (2012). Judgment Before Nuremberg: The Holocaust in the Ukraine and the First Nazi. Open Road Media. Retrieved 16 April 2013. ^ "Приложение Демоскопа Weekly". Demoscope.ru. 15 January 2013. Archived from the original on 12 October 2013. Retrieved 14 April 2013. ^ "Powered by Google Docs". Docs.google.com. Retrieved 14 April 2013. ^ YIVO | Population and Migration: Population since World War I. Yivoencyclopedia.org. Retrieved on 2013-04-14. ^ American Jewish Year Book 2012. Springer Publishing. 2012. p. 225. ^ "The Virtual Jewish History Tour – Ukraine". Jewishvirtuallibrary.org. Retrieved 16 April 2013. ^ "Ukraine President Orders Return of 700 Torah Scrolls Confiscated by Communist Government", Religious Information Service of Ukraine News, November 2007. ^ Ukraine election:President Yanukovych party claims win, BBC News (29 October 2012). Winer, Stuart. Ukraine okays ‘zhyd’ slur for Jews, The Times of Israel, 19 December 2012.
International Business Times, Svoboda: The Rising Spectre Of Neo-Nazism In The Ukraine, 27 December 2012. Outrage as Ukrainian politician attacks Mila Kunis and labels her a 'dirty Jewess', London Daily Mail, 20 December 2012. Ukraine election:President Yanukovych party claims win, BBC News (29 October 2012). Reuters (25 September 2011). "Svoboda". Kyiv Post. Retrieved 25 September 2011. Donetsk leaflet: Jews must register or face deportation, antisemitism.org (16 April 2014). ^ a b "Ukrainian Jews immigrate to Israel amid growing unrest". Times of Israel. 4 May 2014. Retrieved 12 May 2014. ^ 150 Jews who fled Ukraine fighting expected in Israel, Jewish Telegraphic Agency, 7 August 2014. ^ Israel rescues Ukrainian Jews stranded by fighting by Reuters (reprinted in the Jerusalem Post), 27 May 2014. ^ "Archived copy" (PDF). Archived from the original (PDF) on 12 August 2014. Retrieved 28 July 2014. CS1 maint: Archived copy as title (link) "The Ukrainian Crisis and the Jews: A Time for Hope or Despair," Israel Journal of Foreign Affairs VIII : 2 (2014) pp 77–85. ^ "Chabad of Dnepropetrovsk - Dnepropetrovsk, Ukraine". Chabad.org. Retrieved 1 December 2015. ^ Shulman, Ian (15 January 2013). "World's biggest Jewish community center opens in Dnipropetrovsk, Ukraine". Jewish Journal. Retrieved 1 December 2016. ^ Chesler, Chaim (22 October 2012). "The Menorah Center: Largest Jewish complex in world". Jerusalem Post. Retrieved 1 December 2016. Weiner, Miriam; Ukrainian State Archives (in cooperation with); Moldovan National Archives (in cooperation with) (1999). Jewish Roots in Ukraine and Moldova: Pages from the Past and Archival Inventories. Secaucus, NJ: Miriam Weiner Routes to Roots Foundation. ISBN 978-0-96-565081-6. OCLC 607423469. Wikimedia Commons has media related to Jewish cemeteries in Ukraine.